Height Markers 2ft. - 5ft. 3ft. - 6ft. 60cm. - 155cm. 90cm. - 180cm. Sweet chart to track your little one's growth with vintage map of Africa peeking through a white foreground. "Grand adventure" quote from Winnie the Pooh! Printed on heavy-duty canvas with dowel rods and ribbons for hanging. Canvas measures 10x40 inches. 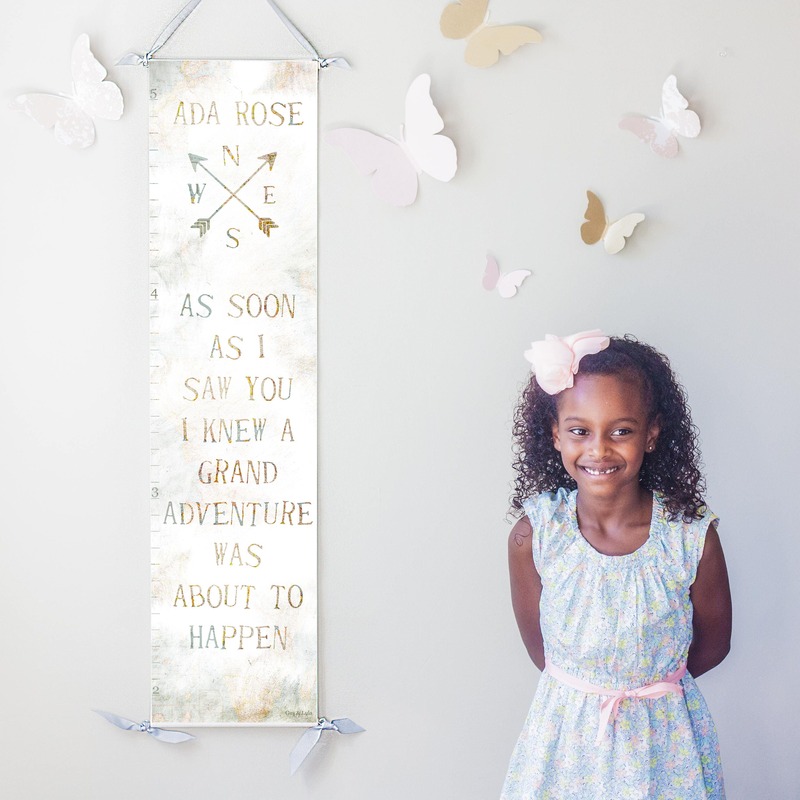 All of our growth charts are now customizable with your little one's name. Just choose the Personalized option and leave a note at checkout with the name you would like on your chart. We now offer more options for height markers. Choose either 2-5 ft. or 3-6 ft., with a marker at each inch and a number at each foot; or choose 60-155 cm. or 90-180 cm. with a marker at each centimeter and a number every 5 centimeters. Each of our prints is designed lovingly by Britt (during nap time!) and printed locally in the USA. We're humbled to announce that we are now able to give more than 50% of all profits from the shop back to Christian ministries, adoptions and missions work. Soli Deo Gloria. All artwork images are copyrighted by and are the exclusive property of Gus & Lula. All rights reserved. Any other use of these artwork images, without the express written consent of Gus & Lula, is strictly prohibited. Payment is due upon checkout. We accept Paypal and credit card. We will cancel unpaid orders within 24 hours unless otherwise arranged. All orders will be sent to the address that is on record with paypal or your credit card company. If you would like your order sent to a different address, please advise. All orders ship within one week. If quicker shipping is required, please convo me to make arrangements. All prints ship flat in rigid mailers with carboard backers and protective polypropylene envelopes. Please shop with complete confidence. If you are ever dissatisfied with your purchase for any reason at all, just send us a convo and we promise we'll make it right.